This page provides you with Medical Doctor resume samples that you can use for inspiration in writing your own resume, or for creating one through our easy-to-use resume builder. Below you'll find our how-to section that will guide you through each section of a Medical doctor resume. As a Medical Doctor, you are well aware that yours is one of the most competitive and fiercest industries out there. If you are looking to get inspired by the best medical doctor resume sample in the market, close those other web tabs you’ve opened: you have reached your destination! There are so many key details in your profession that you might be a bit confused and unsure of what to include and what not. We are here to help you, as we helped thousands of doctors over the last year. They asked, we delivered, and they are now enjoying that dream job they had always been looking for! As we mentioned earlier, competition in your field is extremely high: you need to craft an excellent Medical Doctor resume. We’ll keep it simple and organize, so let’s start from the format: the reverse-chronological layout will introduce the recruiter and hiring manager to your freshest wins up front. Match clean white spaces with big headings. Before you send out your resume, check the grammar: for a Medical Doctor like you, attention to detail is fundamental and we don’t want the recruiter to bin your resume just because of a typo. Last, preserve the layout of your resume saving is as a .pdf document: don’t use Microsoft Word! This section is your chance to pitch the recruiter in 60 seconds, to convince them that you are the perfect fit for that medical doctor position you are applying for. Help them make a final decision with a succinct and precise summary. Summarize the last 3 jobs you have had. Use more than 6 sentences in this paragraph. There’s so much you could add that it is fundamental for you to pick your top responsibilities. Are you a surgeon who operate on patients to treat multiple injuries and threatening ilnsesses? Have you deal with cancer, physical deformity and broken bones? Make sure you include all of that in this section, to show a recruiter why they should pick you. What is more, the history of your employment could allow a recruiter to say for certainty you’ve got the experience to work as their Medical Doctor. If you need more tips on writing the best work experience section for a great Medical Doctor like you, check out our detailed resume guide. Education simply shows the person you are and where you’ve started, so please make sure you take your time to further elaborate on this section. You most likely have rigorous education and training/certifications you have taken over the years: four years of undergraduate school, four years of medical school, and, depending on your specialty, three to seven years of an internship or residency program. It is fundamental that you showcase your education! This is a very important section for a Chief Engineer’s resume as client’s are searching for specific skills that their hire must have to complete the job. Don’t add skills not suited to the position of medical doctor. 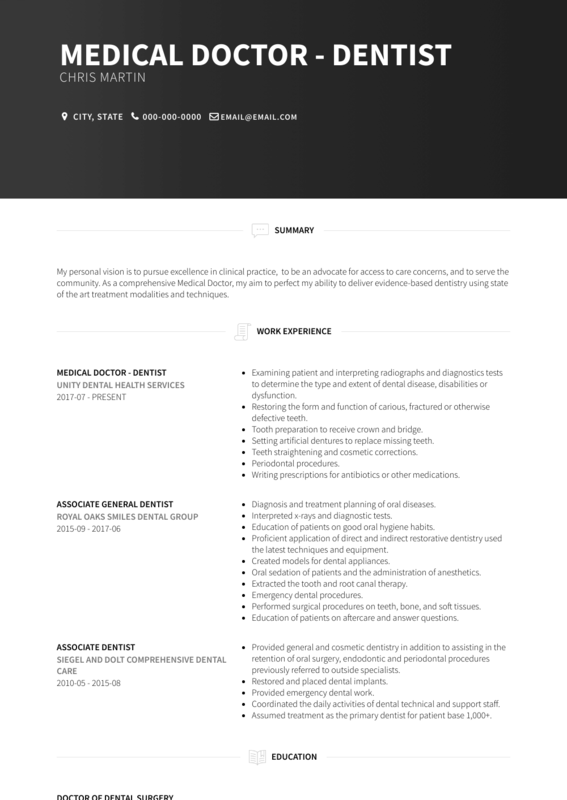 If an excellent medical doctor Resume sample is not enough, why don’t you check out one of the most efficient medical doctor resume templates in the market? Many professionals like you have successfully used it to take their career to the next level.